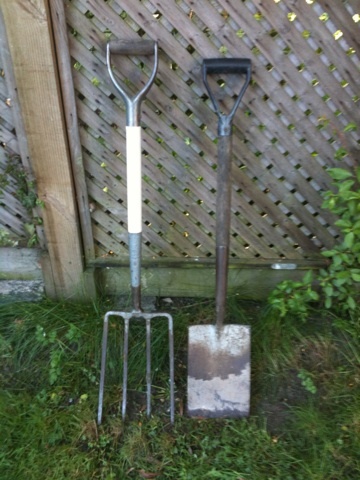 We searched far and wide for recognisable garden implements but without success. 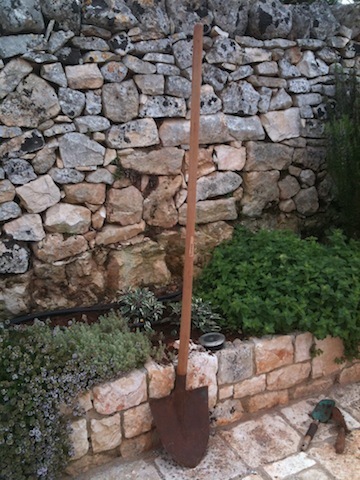 The common, or garden, fork and spade in their English form are simply not known in Italy. The same is true of the hand fork and trowel. The Puglian design seems to be unchanged from it's mediaeval forebears and lies somewhere between a shovel and a spade. It has a shield shaped blade and long straight handle. I must say I do prefer the English version. The blade has a more pronounced flange across the top for applying foot pressure. The shorter haft and D-shaped handle allow the digger to apply, or control, turning action. We met an ex-pat couple at the local garden centre who had resorted to bringing a fork and spade out in their hold luggage. We may consider doing the same. When I went out at Easter the chainsaw went in the hold no problem. This last trip I took a Bosch eletric sander in my hand luggage. Went through Heathrow screening OK but the guy at Milan could not work out what it was. I had to dig it out to the amusement of his colleague on the search table.